Transporting shoot personnel – guns, beaters, pickers-up, etc has never been easier. 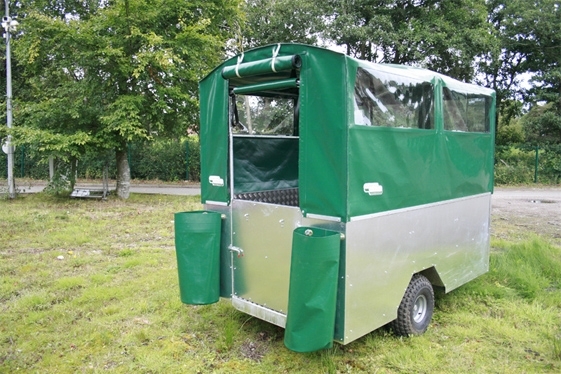 At Cunninghams we can create a bespoke cover for your field sport trailer that fits tight to your specifications. Easily measured and fitted by you without any hassle, as we will make the cover exactly to your measurements. Want some windows? Extra pockets? No problem. The expert team at Cunningham Covers can tailor your cover to suit your specification. This cover is made in toughest 610gsm PVC which ensures a strong and durable cover that will stand the test of time in the roughest of terrains. It is also available in 900gsm PVC for extreme conditions. Your cover can be made with extra features such as handle straps inside the cover to help users when standing in the trailer. Contact us now so we can talk through your new Fields Sports Trailer Cover. We made this shoot trailer cover in khaki, 610gsm heavy duty PVC for this trailer used to transport shoot personnel – guns, beaters, pickers-up, and dogs on shoot day. Do you want a cover like this one? 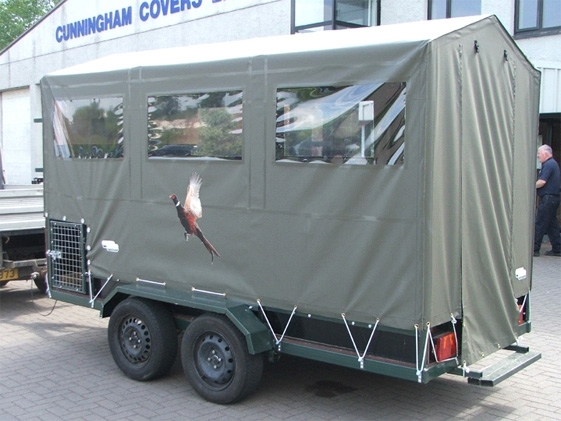 If you would like a field sports trailer cover, submit your details and request a quotation for a cover or give us a call on 028 7964 2638. If outside the UK call us on 004428 7964 2638.